Australian Quilts in Public Places (AQIPP) is an initiative of The Australian Quilters Association Inc. Entries are invited for the 2011 exhibition, which will have a theme of Forest Threads. The exhibition will be held from 11 November to 21 December 2011 at Box Hill Art Space in Melbourne. Contact for enquiries: Pam Hammer, phone 03 9873 4371. Entry forms: can be downloaded here, or send a stamped self-addressed envelope to AQA - AQIPP, PO Box 224, Surrey Hills Vic 3127. The closing date for entries is 5 October 2011. 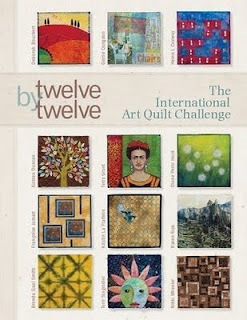 Congratulations to Guild member Brenda Gael Smith who is one of the co-authors of the newly-published book, Twelve by Twelve: The International Art Quilt Challenge. It is published by Lark Books and is now available. 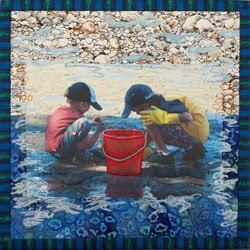 Over the course of two years, twelve quilt artists from around the world challenged each other to create small quilts on a theme of one of the artist's choosing. The result: 144 twelve-inch art quilts created by the Twelve by Twelve group. Members will recall seeing a presentation on this challenge by Brenda at the Burwood meeting in May last year. 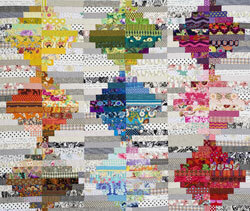 All 144 quilts have been on display at three venues in Australia in 2010 and are now travelling overseas. Brenda will donate a copy of the book to the Guild so that members can share the story of the Twelve by Twelve international art quilt challenge. Look out for it in the Guild library soon. We will be making hand applique blocks for community quilts - the theme will be blocks suitable for children. Roslyn Moules has kindly offered to provide the fabric and templates, just bring along your sewing kit and join in the fun. For further information contact Maree Gebhardt. The exhibition will be held from 11 to 21 December 2011 at Box Hill Art Space in Melbourne. As a shop owner, I see people searching for fabrics all day every day. Colour is often a confessed stumbling stone for many quilters. Confidence ebbs and flows as fabric fashions change and the way we view colours and combinations of colours. This class will teach you about you while exploring and your stash to make a fun quilt that reveals what you like and don't like to buy. see the Guild website for more details. You won't want to miss the first Burwood meeting of 2011, which has a theme of miniature quilts. To add to this program we have an extra guest speaker, Anne Sommerlad. 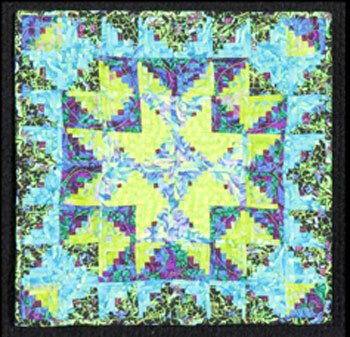 Ann will be discussing her miniature quilts and will have patterns for sale. Don't forget to bring along your miniature quilt to share! Theme - Miniature quilts - bring along yours to share! At this meeting, the Guild will be accepting donations of any sewing related items - pins, needles, threads, rulers, rotary cutters etc. These items will be forwarded to the Queensland Quilters to distribute to Guild members as part of a Queensland Flood Assistance initiative. Financial donations will also be accepted. PS: If you downloaded the code for the previous quilt show buttons, you will see that it has been automatically updated to display the 2011 button - no further action required! 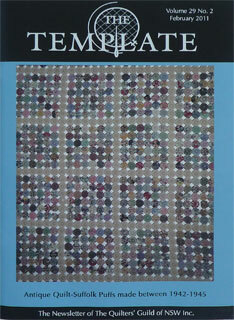 The February issue of the Guild newsletter The Template has been dispatched to members. It is full of interesting items including the entry form and volunteer form for the 2011 Sydney Quilt Show. The closing date for the return of entry forms is 11 March 2011. Download the 2011 Quilt Show Entry Form (156KB PDF) for details about the categories and the conditions of entry. All entrants are requested to also complete a Volunteer Form. Please direct any queries to the Exhibition Secretary. February 2011 Newsletter - look inside for the quilt show entry form! Note: To enter a quilt in the Sydney Quilt Show, you must be a member of the Guild for the current 2010/2011 financial year. Membership is due 1st July each year for the year ending the following June. Download a Membership Application Form (196KB PDF).